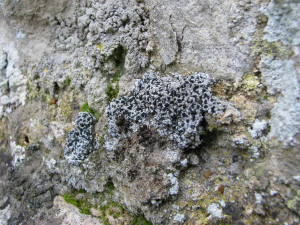 Light grey, warty, lumpy thallus with clumps of black lecideine apothecia giving noticeable spotted appearance from some distance. Growing along angle between vertical church limestone wall and sloping limestone ledge. Apothecia have flexuose proper margins. K -, C -. Possibly Toninia aromatica.